Just a quick review here because I’m not sure too many of you will read this. However, sometimes a student asks me about books with some rock ‘n’ roll history. Usually they’re looking for stories of Jim Morrison, Jimi Hendrix, Janis Joplin and the like. 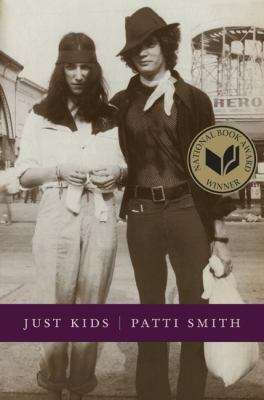 In Just Kids, Patti Smith discusses all of these people and more–Mic Jagger, Allen Lanier (of Blue Oyster Cult), Slim Shadow (Sam Shepard), Bruce Springsteen. Some of them she just meets in passing; others she has a deeper connection with. And during her years of living with and near Robert Mapplethorpe, her muse and soul mate, while they are ‘just kids’ she also makes connections with famous poets, artists and cultural icons. And Smith becomes a famous rocker in her own right–as well as a poet and visual artist. The real story here is about her long relationship with Robert Mapplethorpe and the interconnections in their art. But within that is a great view of New York City in the late sixties and early seventies, with all its famous and soon-to-be-famous musicians and artists. The book won the National Book Award. Good stuff. If you’re a rock fan, enjoy. This entry was posted in Biography/Memoir, Mature Readers, Non-fiction and tagged Adult books for teens, book reviews, Common Core standards, Janis Joplin, Jimi Hendrix, Patti Smith. Bookmark the permalink.